Brute controls biting and sucking lice, horn flies and other pests. Its low-volume application rate reduces waste and animal stress. One 16 oz. bottle can treat up to 32 animals (1000 lb. or larger). Brute® can be used on lactating and non-lactating dairy cattle and beef cattle with no withdrawal time required. It is non-systemic and can be used year round without the worries of reaction that sometimes occurs with cattle grub treatment. Brute® provides horn fly control for up to 6 weeks after application. Use on wounds to kill and repel ear ticks, mosquitoes, fly maggots, gnats, stable, horse, deer, face, house, and horn flies on beef and dairy cattle, sheep, goats, swine, and horses. Also controls blood-sucking lice. Five-day slaughter withdrawal for swine. Permethrin. 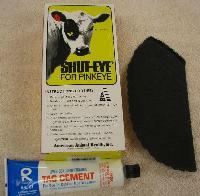 Livestock eye patches help protect the eye from sunlight, wind, dust, insects and other irritants.